You can cleave to your spouse and live happily ever after, but if you cleave your spouse, things must be very unhappy. 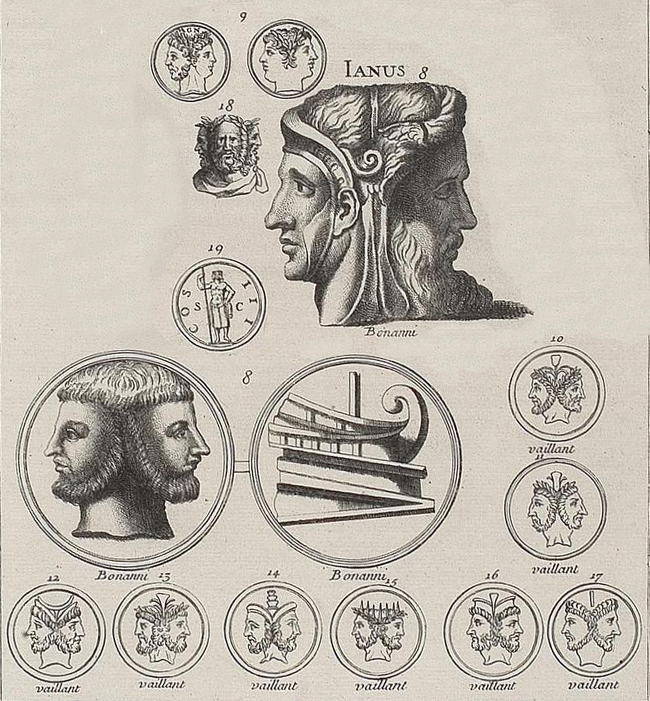 In this case, the two meanings of cleave, “stick together” and “cut apart”, come from completely different Old English roots whose pronunciation eventually converged. Luckily, the preposition to prevents ministers using the Book of Common Prayer from urging murder on newlyweds. Things really get fun when you find situations that leave the meaning potentially ambiguous. There’s no intrinsic reason why someone told to “trim the tree” couldn’t prune the tips of all the branches, or why trimming your hair couldn’t mean looping it about with ribbons and fancy pins. If you serve turkey with all the trimmings, why don’t you dish up the meat alongside all the fat you cut off it? Trim originally seems to have meant “strengthen,” but also “set in order, arrange,” which meaning embraced both “make neat by cutting off untidy ends,” and “make neat by decorating.” Both those senses appeared around the same time in the early sixteenth century. But while it makes at least as much sense to cut untidy branches from a tree as to decorate it, if you want your tree cut neatly, you would never use the word trim. You can trim a hedge with shears, but a tree must be pruned. Unless you’re Amelia Bedelia, there’s no confusion here. Consider “The alarm clock went off.” Was there a power outage, or is it time to wake up? Why is that in baseball you don’t want to strike (miss), when the whole point is, after all, to strike (hit) the ball? Originally baseball players did mean hitting the ball with the word strike, having either fair or foul strikes of the ball. Apparently around the turn of the last century “foul strike” was shortened to “strike,” which then retained only its negative meaning. Did the supervisor’s oversight mean things were closely inspected, or carelessly unregarded? “Supervision” came first, and “omission” about 150 years later. Interestingly, this word is ambiguous only in the noun form. In verbs, the attentive supervisor oversees, and the careless one overlooks. You may look around as your party’s winding down and ask who’s left… But will the answer include those who are still there or those who have already gone? The ambiguity here works only because of the coincidence that in English both is and has can be contracted to ’s. The actual words clearly mark who is left as staying and who has left as going, because the first is the passive voice and the second is active. The same principle would work if you looked around at the end of the cannibals' feast and asked who’s eaten. The only difference is that the frequency of the passive construction to be left has led to left taking on the usage and properties of an adjective meaning remaining as well as being the past tense of the verb leaving. While researching for this post I found several lists of alleged contronyms, but I didn’t consider most of them to be truly in this category. There are lots of words that can be used in opposite contexts, but with the word itself keeping the same essential meaning. For example, if you cut in line you’re joining the line, but if you cut a class you abandon it. Is cut a contronym? I don’t think so, because the word cut still means “slice” either way. It’s only a question of whether you’re slicing a line in half in order to slip into the gap or slicing a class right out of your schedule. Or if you toss out several ideas, are you adding them to the brainstorming pool, or eliminating them from it? It doesn’t matter, because toss means “throw” either way. Just because you can toss something either in or out doesn’t mean toss is its own opposite. I’m also not counting slang meanings where bad means “good”, for example, since those are deliberately self-conscious about being their opposite. What do you do if the teacher tells you you have outstanding homework? (Does it make a difference to say that your homework is outstanding?) Will your grade be an A+ or a zero? Contronyms are just one of those fun quirks of language that make life potentially confusing, but more likely amusing. As for the word itself, it was coined in 1962 by Jack Herring. 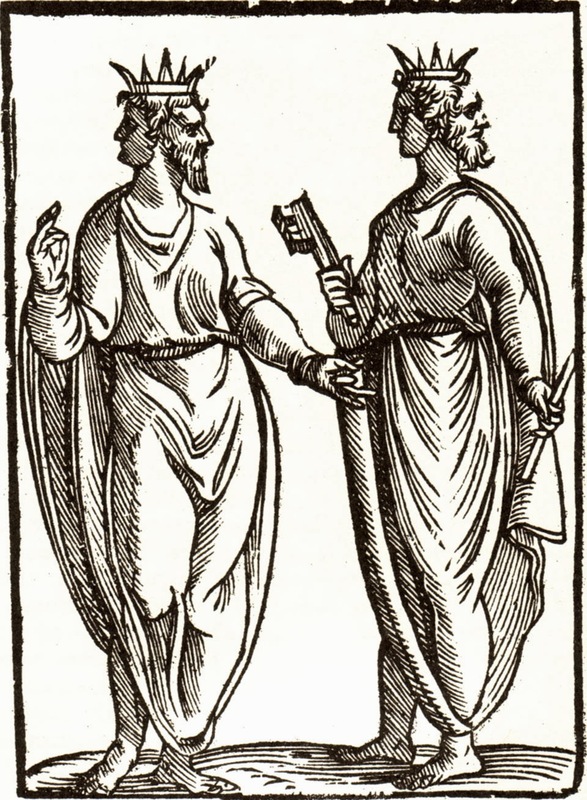 Janus, woodcut by Bolognino Zaltieri from Imagini dei degli Antichi by Cartari, 1571 (Image from Giornale Nuovo). 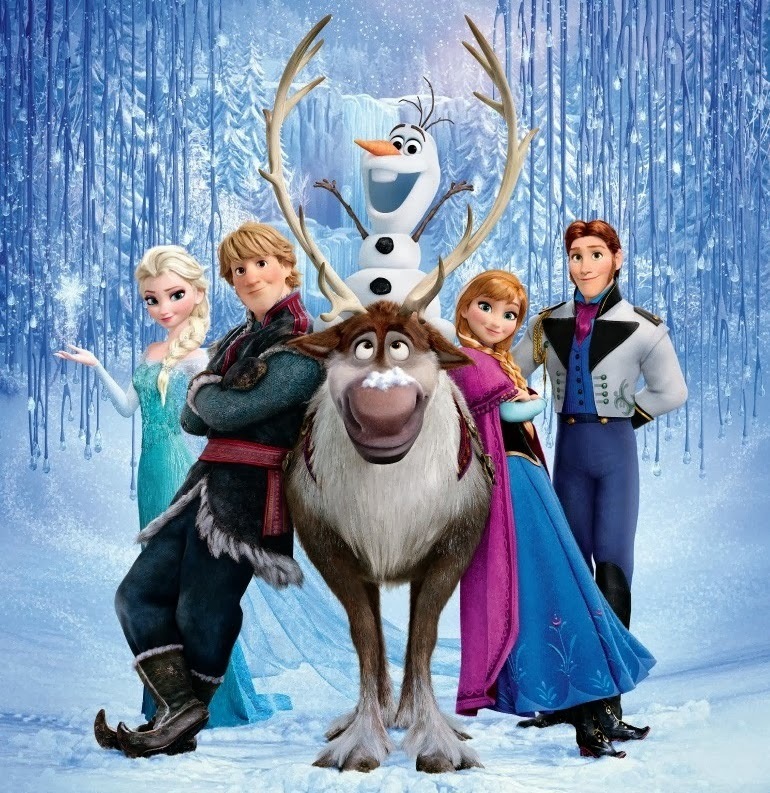 I finally saw “Frozen” this weekend with T, who had been wanting to go for some time. Although inspired by Hans Christian Andersen’s “The Snow Queen,” all that it really has in common with that tale is a snowy queen, a sliver of ice in a heart, and a reindeer. If they’d titled the movie “The Snow Queen,” that might have irritated me, but since the movie never claims to be Andersen’s tale - and is, as it happens, a much better story anyway - all is well. I never particularly liked Andersen’s “The Snow Queen” anyway. I enjoyed the movie very much, the more as it has a couple of interesting differences from your average Disney animated feature. Most importantly, this is a story about family dynamics and love between sisters as much as - or more than - romantic love. Although the sisters Elsa (the “snow queen”) and Anna are antagonists through most of the story, everything they do towards each other is really done out of love. This is also a story about figuring out what your gifts are good for. It’s got the message (certainly common enough in movies for children and young adults) that what makes you different makes you special. But this movie goes a little further, with the message that your gifts become positive and productive only when they’re controlled by love rather than fear. As for the romance in the story, Anna’s notion of “love at first sight” is rejected by other characters, and although Anna does come to a more developed love eventually, Elsa is shown as complete and happy without a romantic partner at all - another unusual twist for a Disney princess. The ice and snow are beautifully animated (although a yellow stained spot on the movie screen showed up a lot more noticeably in this movie with all its white!) I will say that I wasn’t particularly smitten with the songs, and I wasn’t a huge fan of their very pop style, but that’s just a matter of taste. The design element I found most jarring was Elsa’s ice dress. For the most part the movie goes for a Scandinavian-inspired style, with great traditional architecture and Norwegian designs on clothes, etc… but when Elsa lets loose her icy powers, she gives herself a slinky dress that looks straight out of some anachronistic red-carpet event, complete with slit up the thigh. Even weirder, she starts sashaying about like a runway model with swaying hips and provocative glances over her bare shoulders, all while singing about how being a good girl is what’s holding her back… The sudden sexualization (however minor and G-rated) is slightly inappropriate anyway, but particularly strange considering that it’s in the scene where she’s committing herself to total isolation. Still, despite finding this one aspect of the movie jarring, it really wasn’t too egregious. I didn’t find the comic sidekicks as charming as some others in the history of animated movies, although they were fine. (My favorite comic character was actually the villainous Duke of Weselton dancing at the ball. Also, I liked Hans and Anna’s line that was something about how it must be love because we always finish each other’s… sandwiches.) But while aspects of the movie were merely fine, there were other aspects that were exceptional. - There was one plot twist that actually took me completely by surprise. - The portrayal of the sisters’ growing estrangement and continuing love was very strong. 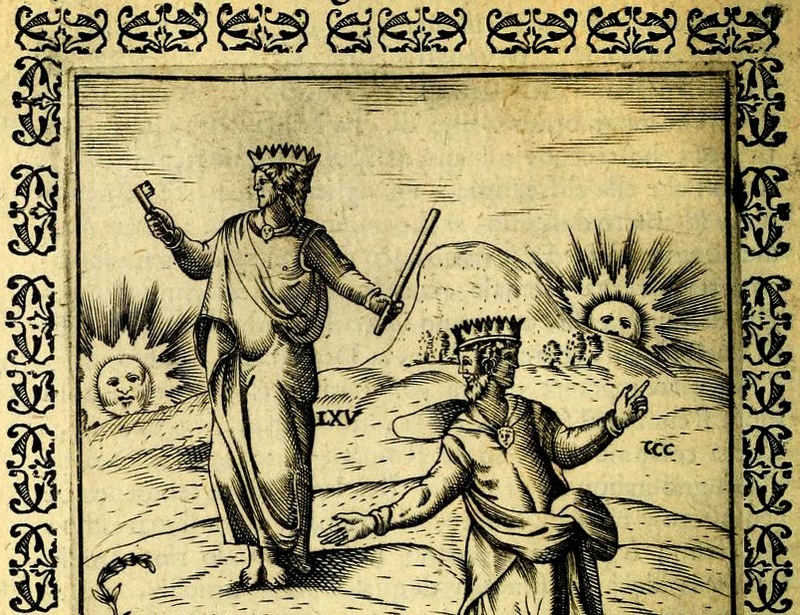 - The depiction of snow and ice as both positive and negative, dangerous and vital, was nuanced and interesting. - Some of the scenes were visually gorgeous, including the storm at sea and most of Elsa’s cryokinetics. I cried copiously throughout the movie, and while that doesn’t necessarily say much since, as my family will tell you, I cry at everything, I did find certain scenes very moving. As for T, she enjoyed the movie thoroughly. Her favorite character is Sven the reindeer, but she rates the entire movie “totally awesome." Don’t despair - spring is on the way! I’m out of town this week but wanted to set it to post a little something for you. This amazing design is an ornament from a page in a seventeenth century Dutch Bible D’s father bought for $3 at a junk sale. I don’t think the subjects in this design have anything to do with the Bible text; they’re just the artist having fun filling space. Today is Valentine’s Day, but we’ve got a much bigger and more important holiday going on, too: Random Acts of Kindness Week, from February 10-16. (And Random Acts of Kindness Day is February 17, at least in New Zealand. I’m not sure about the rest of us.) The idea is to use this week to challenge yourself to “step out of your normal routine or comfort zone and attempt a new random act of kindness each day.” I’ve collected some fantasy picture books with a focus on kindness so you can celebrate by reading them with your kids. And if you really want to make a splash of kindness, why not arrange to read with children in a local school or tutoring program? When someone cares enough to come in and spend time with a child, share a story and listen to the child’s thoughts about it, and leave with a smile, that’s magic, especially for kids who don’t get much opportunity for reading aloud with their own families. Brave Jack and the Unicorn, by Janet McNaughton (illustrated by Susan Tooke) - This is an original fairy tale based on traditional folk and fairy tale motifs, including the despised youngest son, the quest for the princess’s hand, and, of course, kindness that is repaid. McNaughton has made sure that this story resonates well with modern audiences by tweaking her version. For example, it’s explained that Jack is called a fool simply because he’s “too kindhearted,” and that the princess and Jack like each other, but don’t get married until some time has passed. As for the emphasis on kindness, it takes a variety of forms and is duly repaid in a variety of ways, ending with the value placed on kindness by the princess. I don’t find the illustrations particularly inspiring, but this is definitely a book that will appeal to fans of fairy tales - and also those who have qualms about some of the traditional fairy tales. Its kindness quotient is a solid 5 unicorns. The Quiltmaker’s Gift, by Jeff Brumbeau (illustrated by Gail de Marcken) - In this story a greedy king longs for a wonderful quilt made by the magical quiltmaker. The quiltmaker’s kindness to animals is repaid by protection from the king’s punishments, and it’s the king’s eventual kindness that finally earns him a beautiful quilt - and true happiness. This a lovely story, with lovely meticulously detailed illustrations. I particularly enjoy the quilting connection, and the illustrations are full of quilt block references, including appropriate quilt block designs on each page, such as the bear paw block on the page where we meet a bear. I rate it 5 warm snuggly quilts of kindness. Please Share That Peanut!, by Sesyle Joslin and Simms Taback - This is not a standard picture book with a single story plot. It’s rather a series of funny vignettes illustrating the importance of sharing. I say “illustrating” pun intended, because the charming pen-sketch illustrations are vital to showing the plot, and provide plenty of humor to go with the delightfully melodramatic narration. 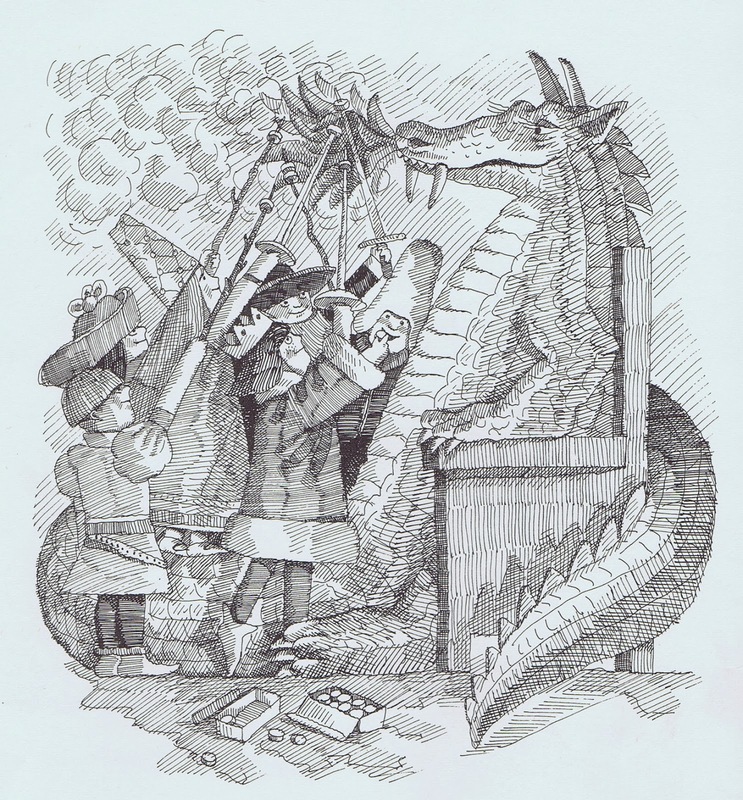 Several of the vignettes have fantasy themes, such as the Danish trolls who plunder a mead-hall (but share the golden goblet they find there) and the prince and princess who are confronted with a fiery dragon (and end up inviting the whole court to roast marshmallows in its flames). Alas, this gem is out of print, but get hold of a copy if you possibly can for its 4-peanut kindness rating. Kate and Sam to the Rescue, by AEGN (illustrated by AEGN, TPN, and PGN) - Although it’s a chapter book, I’m including this because it is meant to be read aloud, and because one of its primary themes is the importance of kindness. The first part of the plot takes the form of a chain story, in which each act of kindness is repaid with a gift that makes the next act of kindness possible. Kate and Sam themselves are determined to be kind to everyone, even when they know it may be dangerous, and it’s their kindness that earns them the friends who help conquer the dangers. I rate its kindness level at 5 purring ginger cats. Finally, just a couple bonus classic books about kindness. These are somewhat less fantastical, but do include talking animals or sentient technology and should be easy to get your hands on. Tawny Scrawny Lion, by Kathryn Jackson - A hungry lion is disarmed by the kindness of the rabbits he plans to eat. Katy and the Big Snow, by Virginia Lee Burton - A heroic snow plow responds to every cry for help even after she’s tired from her long day. There - are you inspired? Now, let’s see some acts of kindness! 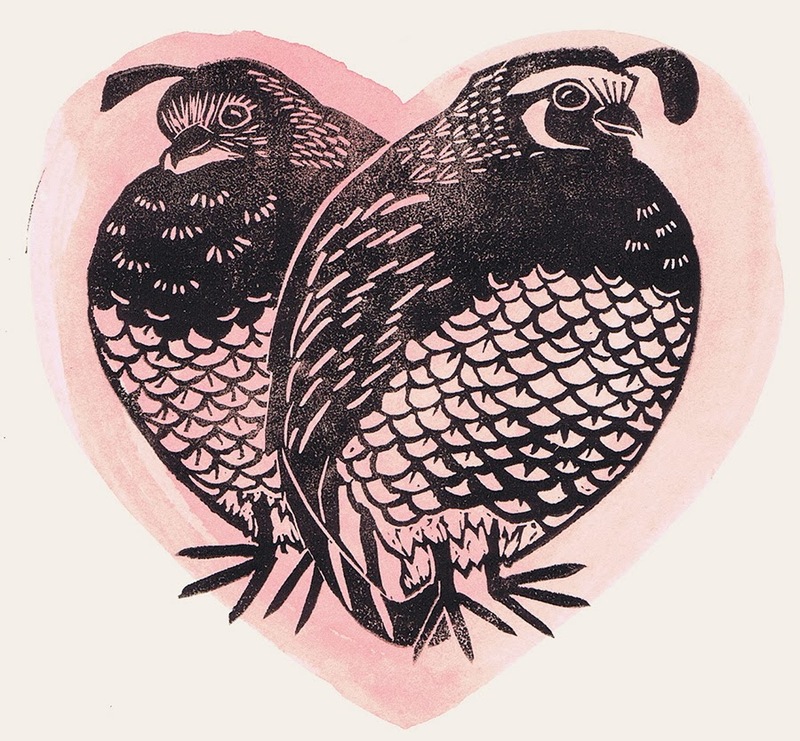 Yvonne Jacquette (USA, b. 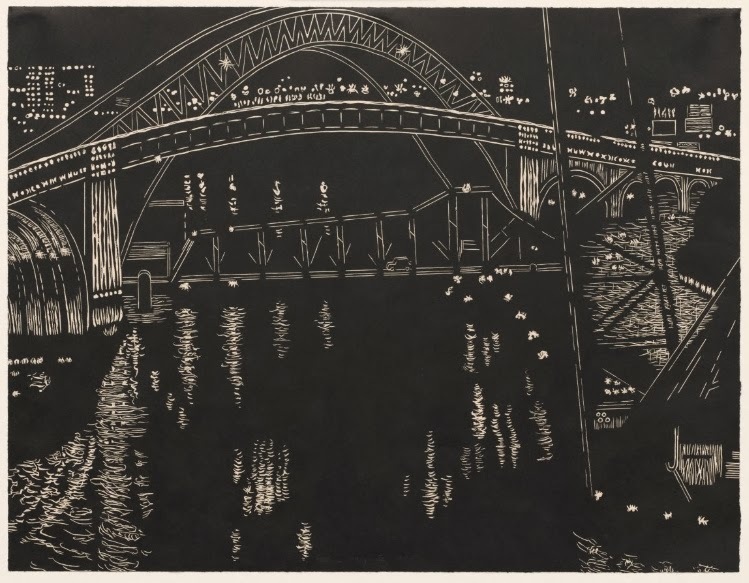 1934) is famous for her aerial cityscapes - paintings, but various printmaking techniques, as well. For a long time I’ve wanted to do a night view of one of my beloved industrial sites, but haven’t been able to get myself in a position to take any nighttime photos to work from. 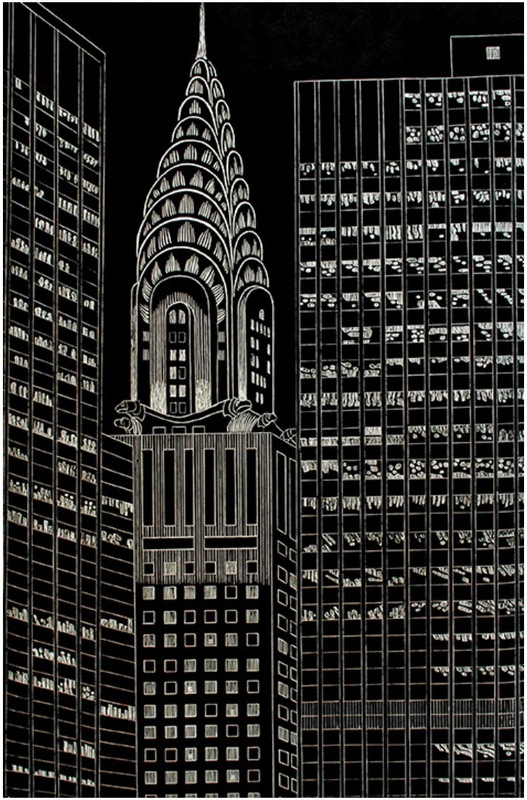 In the meantime, though, it’s interesting to see how Jacquette handles the depiction of buildings in the dark. In this first piece it’s pretty straightforward. The outlines of the buildings are carved in clear lines, the lit windows carved out to white. I like the way the glass windows reflect splotchy, wavy light instead of being solid white squares. This second one is more complex and interesting, I think, because it has no outlines. Each pinpoint of light is carved out and left to build up into a picture without connecting the dots. 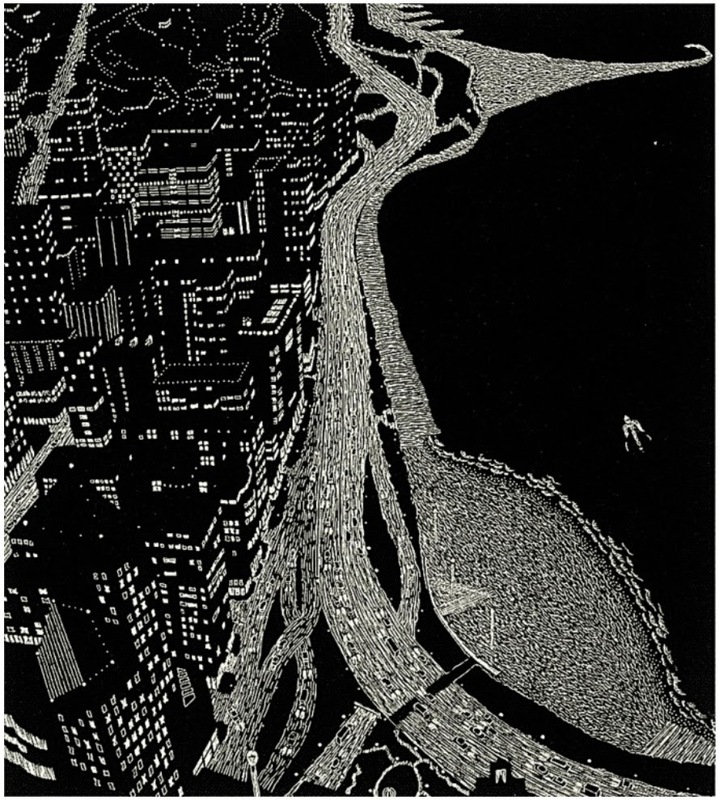 The roads are streams of individual streaks, the reflections on the water short squiggles, and the shapes of the buildings must be inferred from the patterns of their glowing windows. I know the first technique, with the outlines, would be easier for me, but I think this style would be more fun to experiment with. There's No Knowing What We Shall See! It’s time for another fantasy poem, and this one comes to you from that master of the creepy absurd, Roald Dahl. Dahl is famous for many fantasy books, featuring giants, witches, and, of course, magical chocolate factories, but my favorite was always James and the Giant Peach (1961). 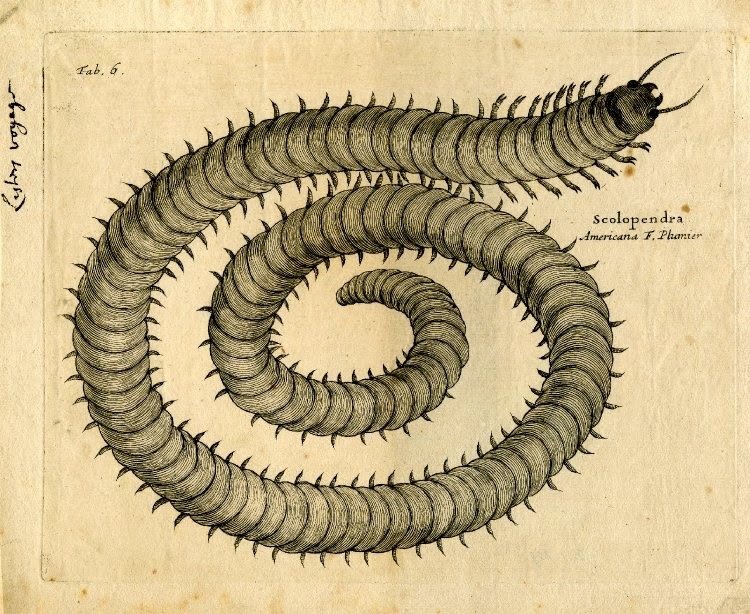 In this poem the giant centipede in the giant peach is, not very comfortingly, encouraging James to set off on his escape from his wicked Aunts Spiker and Sponge. 'There is no knowing what we shall see!' 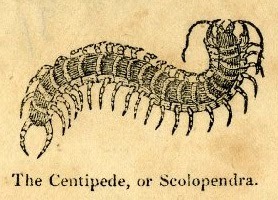 cried the Centipede. He has forty-nine noses to blow. And eighteen for its supper at night. That we won't see a Unicorn there. Growing out of the tufts of his hair. They explode and they blow off your head. We may die in an earthquake or tremor. On the horns of a furious Dilemma. Let us roll! Let us bowl! Let us plunge! Valenti Angelo (1897-1982) was an Italian-born U.S. artist active as an illustrator. He illustrated about 250 books! (He was also a writer, winning the Newbery for Nino in 1939. I’ve never read it, but I guess now I’ll have to go check it out.) 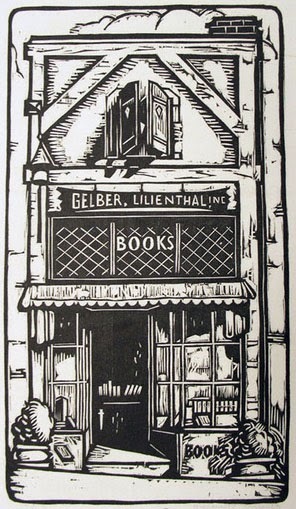 As a printmaker his favorite medium was linoleum. Some of Angelo’s illustrations are the epitome of midcentury modern style, with simple lines, flat shapes, and stylized figures, but he had a long career with plenty of work both before and after the midcentury, so no one style defines him. 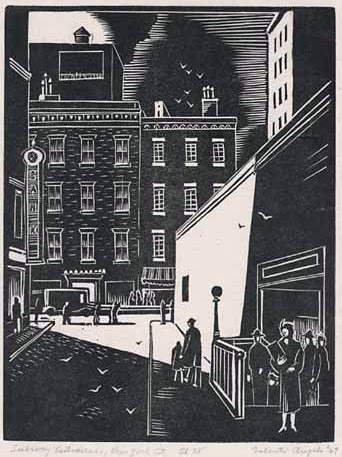 This first block print is similar to a few others I found by Angelo, in his choice of subject, in the high proportion of black, in the small people who are part of the cityscape without being its focus. Angelo was about 72 when he made it, so although it was a later work for him, he was clearly still going strong. An earlier work, by contrast, made when he was in his 30s, has a totally different look. I wouldn’t have guessed it was even by the same artist. It’s got so much more white background around the lines, and looks so much more rounded instead of sharp-edged. 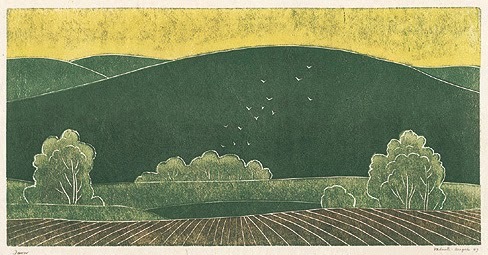 When I was looking for work by Angelo I didn’t see any other pieces that look like this one, so I don’t know whether or not this is characteristic of his work from the 1920s. although perhaps Angelo just inked it doubly because he liked the way it looked. And finally, Cat Art. I include this cat because it represents an extreme of black with only the thinnest of carved white lines. It’s an interesting choice, but apparently Angelo was known for his night scenes, so he must have enjoyed experimenting with this style. 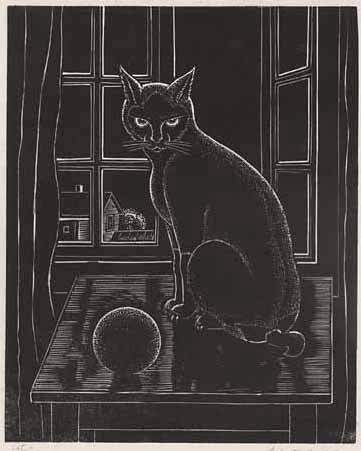 It isn’t that he hasn’t carved much - the roundness of the cat’s body is defined by thousands of tiny gouges - it’s just that each carved line takes away so little of the black.